A fetal heart monitor can be a useful tool when you’re pregnant and still months or weeks away from giving birth. While it’s not recommended that you use one for more than 10 minutes at a time or more than necessary in order to hear your baby’s heartbeat, it’s a handy accessory to be able to have in your home. Nothing is quite like hearing your baby’s heartbeat for the very first time and being able to use one of these top 9 fetal heart monitors after your first trimester can help you stay connected to the baby growing in your belly while also having a peace of mind regarding his or her health along the way. The Bjingles Heartbeat Baby Monitor is more of a set made especially for parents who want to listen to and record their baby’s first sounds in the womb. The set comes with the fetal heart monitor, a pair of headphones and earbuds, a recording cable, user manual, and 9-volt battery for your convenience. There’s a simple on and off switch you can access at any given time and also a volume control and since there are two different headsets, both you and your partner can listen at once. You can also record your baby’s kicks and heartbeats for later listening. Special Features: The Bjingles Heartbeat Baby Monitor also pairs with an iTunes or Google Play app of the same name so you can save recordings easily and keep track of your pregnancy along the way. Where To Buy: You can find the monitor on the manufacturer’s website and on Amazon. The Best Part: With the available phone app, you can save the sounds of your baby’s heartbeat, but you can also record and play special messages for your baby to hear while in the womb. The Not So Great: Once it’s on your stomach, actually moving it around can make loud static noises. Price: On Amazon, the Bjingles Heartbeat Baby Monitor is $54. Check out the latest price! With the Up & Raise Digital Fetal Heartbeat Monitor you have two options for listening — you can either use headphones to have a more intimate listening experience, or you can choose to allow those around you to listen in on the loudspeaker of the doppler and share in the experience of hearing your baby’s heartbeat at home. The technology behind the monitor allows you to hear your baby’s heartbeat and also see the heart rate on the LCD screen to help give you peace of mind throughout your pregnancy. It also boasts a more sensitive detector, so there’s less beeping and moving around to be able to capture your baby’s heartbeat more quickly. Special Features: With the option to listen to the heartbeat without headphones, you can share the experience with others all at once. The Best Part: Though it’s not recommended that you use at-home dopplers before your first trimester is over, this particular one is so strong that it will pick up a heartbeat even at just 10 weeks. The Not So Great: Some parents may find that the actual heart rate on the little screen is vastly different than what a doctor may pick up. Price: On Amazon, the Up & Raise Digital Fetal Heartbeat Monitor is $60. Although lubricating gel is recommended when using the AngelSounds Fetal Heartbeat Doppler. You don’t necessarily have to put anything on your belly in order to properly detect a heartbeat. It’s essentially an at-home doppler, but it’s also so lightweight and easily portable that you can take it with you on the go as well. With two headphone jacks, you can even listen to your unborn baby’s heartbeat and movements with your partner, which makes the experience that much more special and memorable for you both. Special Features: The double headphone jack makes it possible for more than one parent or loved one to listen to the heartbeat at once. Where To Buy: You can find the AngelSounds Fetal Heartbeat Doppler on Amazon or in-store at Walmart. The Best Part: It’s small and lightweight enough to take with you anywhere as opposed to simply using it at home. The Not So Great: There are no control settings to adjust volume in case the noise is too loud or soft for you. Price: On Amazon, the AngelSounds Heartbeat Fetal Heartbeat Doppler is $42. Check out the latest price! With a doppler, probe, and the appropriate ultrasound gel, the SonoLine B Heartbeat Baby Monitor has everything you’ll need to hear your unborn baby’s noises before he or she even arrives. It also has a small screen to allow you to view your baby’s actually real-time heart rate and with a headphone jack that can also fit a sound recorder, you’ll be able to listen to your baby’s heartbeat with ease. While it comes with neither accessory, though, it does provide a speaker to allow you to listen openly and there’s even an auto shut-off to help preserve battery life. Special Features: You can record sounds and use the doppler to save those sounds to your computer for later listening or sharing. Where To Buy: The doppler is available on the manufacturer’s website and on Amazon. The Best Part: There are three different display options for the small digital screen, which allows you to choose your own preferences. The Not So Great: The included instructions may not be easy to follow for many new parents. Price: On Amazon, the SonoLine B Heartbeat Baby Monitor is $55. Check out the latest price! It may seem similar to some other fetal dopplers out there, but the Figerm Pocket Unborn Baby Sound Amplifier is, at the very least, a lot easier on the eyes. It comes in either a white or primarily pink color which is already fun for some new parents to be able to choose. The LED display has three different modes to choose from, and the set comes with the proper gel for your stomach as well. The doppler can fit standard headphones or earbuds and the jack output is designed for more than one listener at once. Special Features: The additional color option may not seem like a big deal, but for a product that seems so strictly medical in other products, it’s a fun change. Where To Buy: Currently, you can find the doppler on Amazon. The Best Part: The sound quality might seem clearer than with some other monitors. The Not So Great: Unfortunately, you’ll likely get a more accurate heart rate reading if you count it out yourself as opposed to reading the screen. Price: On Amazon, the Figerm Pocket Unborn Baby Sound Amplifier is $60. Check out the latest price! 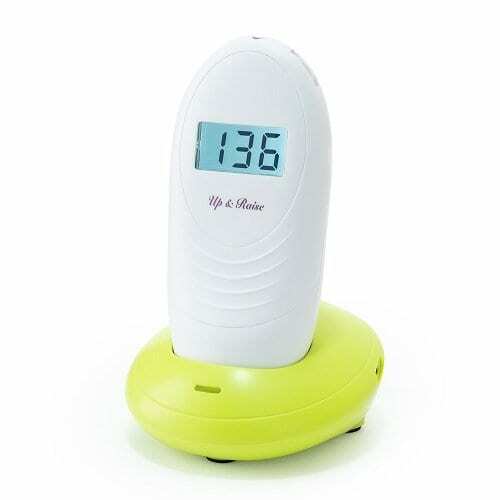 With an easy to read display screen and extra sensitive probe, the Baby Heartbeat Monitor Sound Amplifier By Qiukids Trade is another solid option for any new or experienced parent. It also has an on and off button as well as volume control, which can be so important when dealing with something that may come across as louder than expected at times. Plus, the probe itself is water resistant for quick and easy cleaning after each use, even if you don’t use lubricant. Special Features: The volume, battery life, and heart rate are all easy to identify on the small screen. Where To Buy: You can find the doppler on Amazon at the moment. The Best Part: Even with twins, the doppler can locate the individual heartbeats relatively easily. The Not So Great: Although there is a headphone jack, it doesn’t come with headphones or earbuds to get you started. Price: On Amazon, the Baby Heartbeat Monitor Sound Amplifier By Qiukids Trade is $50. Check out the latest price! When compared to all of the other options on this particular list of the top 9 fetal heart monitors, the Foruchoice Heartbeat Baby Monitor just might be the simplest one of them all. Without a base of sorts, the easy to use probe is your main source for finding your baby’s heartbeat and it requires just one battery to be able to use. Then, you can plug in your earbuds and it’s ready to use. Despite being so simple in design, it can do almost everything else that other fetal dopplers can do, but it just minimizes any complications along the way. Special Features: It may be the smallest and most compact fetal doppler option that you’ll find. Where To Buy: At the moment, you can find it on Amazon primarily. The Best Part: There are no bells or whistles or hard to set up or program parts to the doppler. The Not So Great: Without a screen, you can’t see an actual heart rate and without a speaker, you need headphones to use it. Price: On Amazon, the Foruchoice Heartbeat Baby Monitor is $36. Check out the latest price! With either pink or purple to choose from, you can find another easy to use and complication-free doppler with the Tinsay Heartbeat Baby Monitor. Just pop in a couple of batteries and your own headphones and you’ll be able to start hearing your baby’s heartbeat. There’s just one piece to the doppler, so you’re less likely to lose anything that might go with it and the small digital screen will keep you aware of your baby’s heart rate and the battery life. Special Features: Even though it’s small and compact, there is a built-in speaker so you don’t necessarily have to use headphones at all times. Where To Buy: You can find the doppler on Amazon. The Best Part: It’s small and lightweight enough to use it pretty much anywhere. The Not So Great: Although there is a speaker, some might find it hard to hear it at times. Price: On Amazon, the Tinsay Heartbeat Baby Monitor is $40. Check out the latest price! Instead of being a simple fetal heart monitor with just a probe, the Bambeego Baby Heartbeat Monitor fits in the palm of your hand to be able to roam over your stomach in search of your baby’s heartbeat. It doesn’t have a screen, but there is an LED light to indicate when the machine is on and it does come with two sets of earbuds, a headphone splitter, and a cable to use to record sounds for later listening when you attach it to your phone. It may be a simple doppler, but it definitely knows what parents are looking for in the right at-home fetal monitor. Special Features: You can use the included cord to record the heartbeat on your phone and you won’t even need an additional app to do so. Where To Buy: The doppler is available on Amazon. The Best Part: Even before you feel movements, you’ll be able to hear your baby’s heartbeat with the monitor. The Not So Great: When using a gel lubricant, there is the possibility of some of it getting into the part of the doppler where the battery is housed. Price: On Amazon, the Bambeego Baby Heartbeat Monitor is $50. Check out the latest price! Like so many other baby products, choosing the right at-home fetal heart monitor isn’t going to be as easy as simply choosing one at random from a lineup. There are plenty of aspects to consider, including how well they work to pick up heartbeats, how easy they are to use, and the overall longevity of them. Overall, none of them are particularly difficult to use or learn how to use, but since some are more involved than others and some feature fun accompanying apps, it’s definitely a decision that will involve you heavily weighing your own pros and cons. Since most seem to cost around the same price, it’s all going to boil down to what you really need and want in the right fetal heart monitor and clearly, there are some on this particular list that will get the job done for you.